This Chocolate Butter Cake is moist and tender and the two layers are sandwiched together and frosted with a satiny smooth chocolate frosting. This is the cake I make for birthdays, anniversaries and other festive occasions. It doesn't really need any garnish, but you could decorate with some colorful sprinkles, or it looks great with a medley of fresh berries piled in the center. 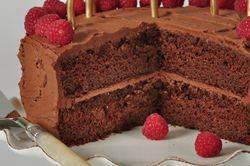 What makes this chocolate cake unique is that we use both unsweetened chocolate and unsweetened cocoa powder to achieve its rich chocolate flavor and color. Unsweetened chocolate is also known as baking, plain or bitter chocolate. This is chocolate in its rawest form and is known by professionals as 'chocolate liquor'. This type of chocolate contains no sugar so it has a strong, bitter taste that is used in cooking and baking but is never eaten out of hand. Besides the unsweetened chocolate, we are also using unsweetened cocoa powder (you can use regular unsweetened or Dutch processed) in this recipe. When adding the cocoa powder to the cake batter, we first need to dissolve it in either very hot coffee or boiling water and this is done to bring out its full flavor. You may also notice that this recipe contains a little extra leavening (baking powder and soda) and this is to counteract the drying and strengthening affect cocoa powder has when used in batters. Once the cake layers have been baked and completely cooled, the layers are sandwiched together and frosted with a delicious chocolate butter frosting. You can use either a semi sweet or a bittersweet chocolate in this frosting. Just be sure to use a good quality chocolate that you enjoy eating out of hand. Chocolate Cake: Preheat your oven to 350 degrees F (180 degrees C) and place the oven rack in the center of the oven. Butter, or spray with a nonstick vegetable spray, two - 9 x 2 inch deep (23 x 5 cm) round baking pans. Then line the bottoms of the pans with parchment paper. First, in a heatproof bowl, place the finely chopped unsweetened chocolate and cocoa powder. Add the hot coffee (or boiling water) and stir until the mixture is melted and smooth. Set aside to cool to room temperature. Meanwhile, in a separate bowl, whisk to combine (or sift), the flour, baking powder, baking soda, and salt. In the bowl of your electric mixer, or with a hand mixer, beat the butter until smooth. Add the sugars and beat, on medium high speed, until the mixture is soft and fluffy (this will take about 3-4 minutes). Add the eggs, one at a time, mixing well after each addition. Scrape down the sides of the bowl as needed. Add the vanilla extract and melted chocolate mixture and beat to combine. Add the flour mixture (in three additions) alternately with the milk (in two additions), beginning and ending with the flour mixture. Beat only until the ingredients are incorporated. Divide the batter evenly between the two prepared pans and smooth the tops with an offset spatula or the back of a spoon. Bake for about 30 - 35 minutes or until a toothpick inserted in the center comes out clean and the tops spring back when lightly pressed. Remove from oven and place on a wire rack to cool for about 10 minutes. Then, one cake at a time, place a wire rack on top of the cake pan and invert, lifting off the pan. Remove the parchment paper and then, to prevent cracks, reinvert the cake onto a greased wire rack so that tops are right side up. Cool completely before frosting. Frosting: Melt the chocolate in a stainless steel bowl placed over a saucepan of simmering water. Remove from heat and let cool to room temperature. In the bowl of your electric mixer, or with a hand mixer, beat the butter until smooth. Add the sugar and vanilla extract and beat until it is light and fluffy (about 2-3 minutes). Add the melted chocolate and beat on low speed until incorporated. Increase the speed to medium-high and beat until frosting is smooth and glossy (about 2-3 minutes). To Assemble: Place one layer of cake on your serving plate and cover with a layer of frosting. Then place the second layer of cake onto the first cake layer and then frost the top and sides of the cake with the remaining frosting. Can garnish with sprinkles, fresh fruit or shaved chocolate.This cake is at its best the day it's made. But it can be covered and stored at room temperature (or in the refrigerator) for about three days.